When looking for a great used car deal, key insights can be gathered about the vehicle even before speaking with the seller. With the proper analysis, shoppers can get an indication about the price, condition, seller and negotiability. However, the analysis is time-consuming. 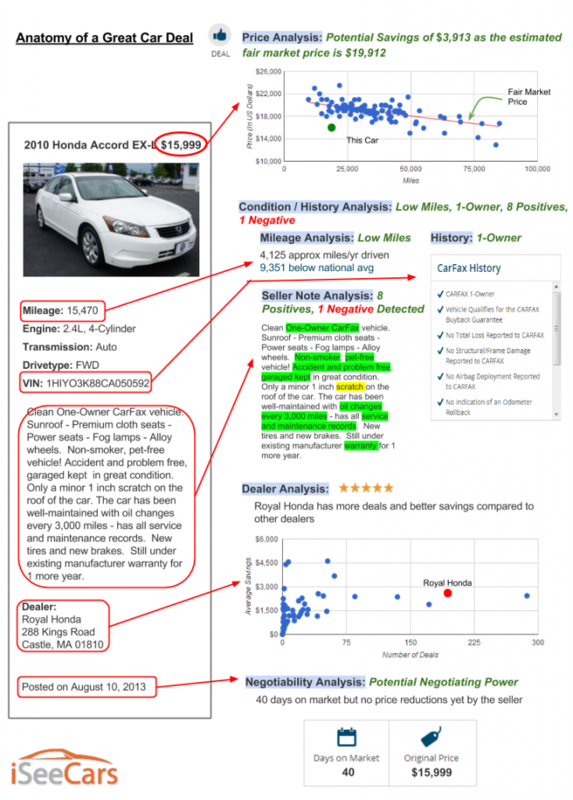 iSeeCars.com has automated that step by analyzing and ranking every used car so shoppers can more easily find the best deals and shop smarter. Here’s an example of what iSeeCars does. Check it out yourself at iSeeCars.com if you’re in the market for a used car. iSeeCars.com is a car search engine that helps consumers find the best deal by providing key insights and analysis about each used car. The proprietary iSeeCars algorithm ranks cars by calculating an overall score based on analysis of the price, mileage, car history, price history, seller’s inventory, and other factors. Based in the Boston area, iSeeCars was founded by former TripAdvisor and SAP developers and executives determined to improve the used car shopping experience.